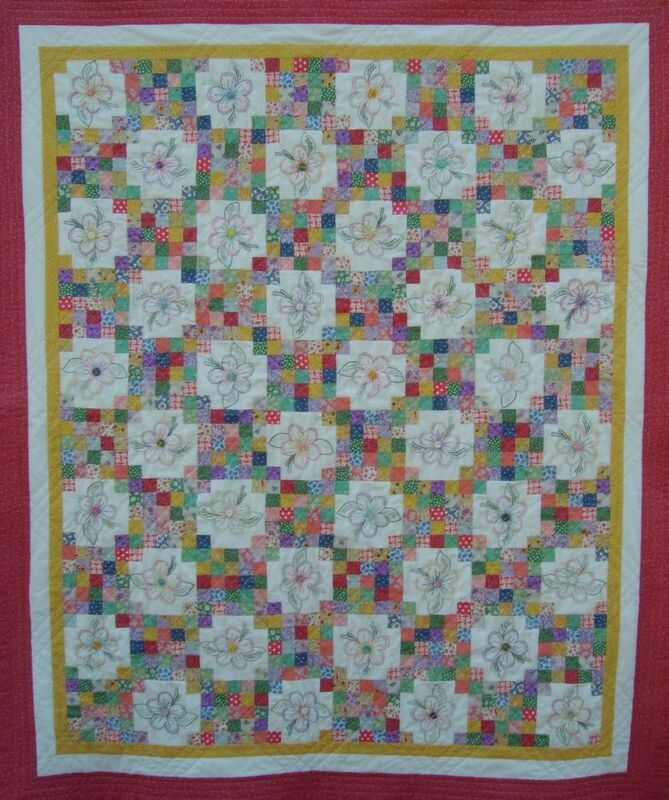 Large Quilt: 40" x 48"
Finished Quilt size: 28" x 30"
and 17" x 22" pattern included! 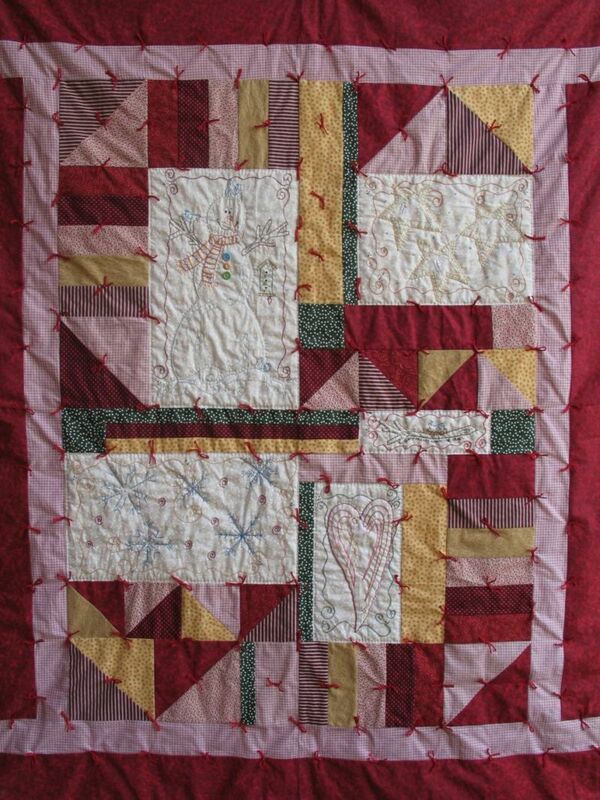 Quilting, for me, will always be a joy. 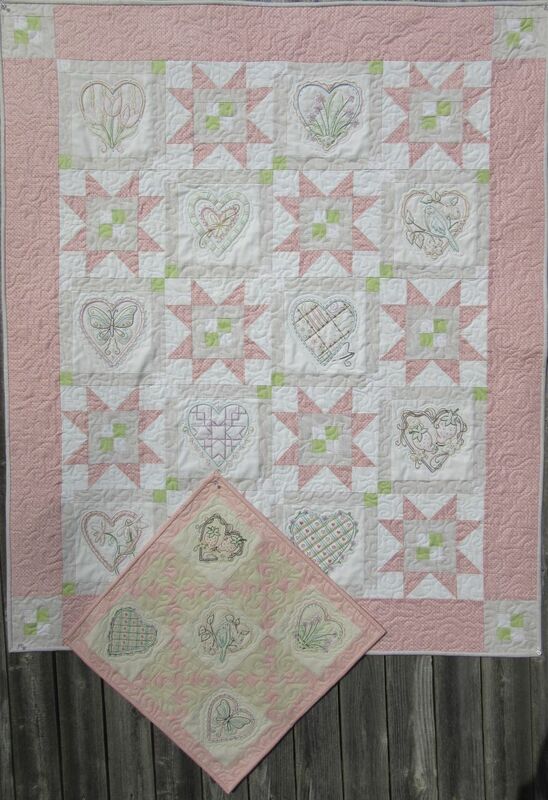 This sweet heart quilt makes me joyous! 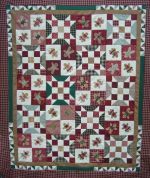 Both the large and small quilt patterns are included. 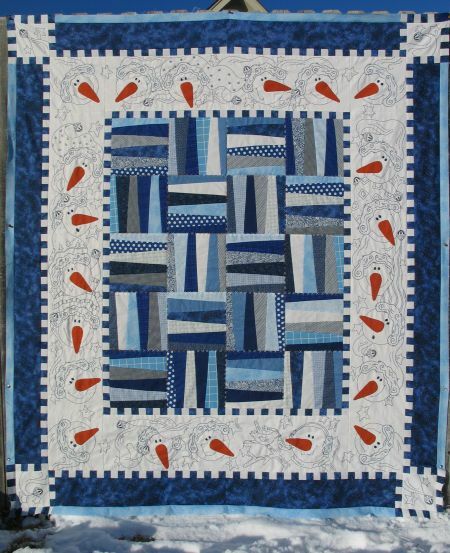 This sweet mini quilt is fun to embroidery with cool blue or vibrant red. You can enjoy it all winter long! 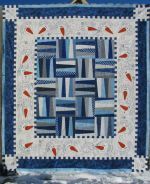 This is a much smaller version of my large Cool Guys Quilt pattern. 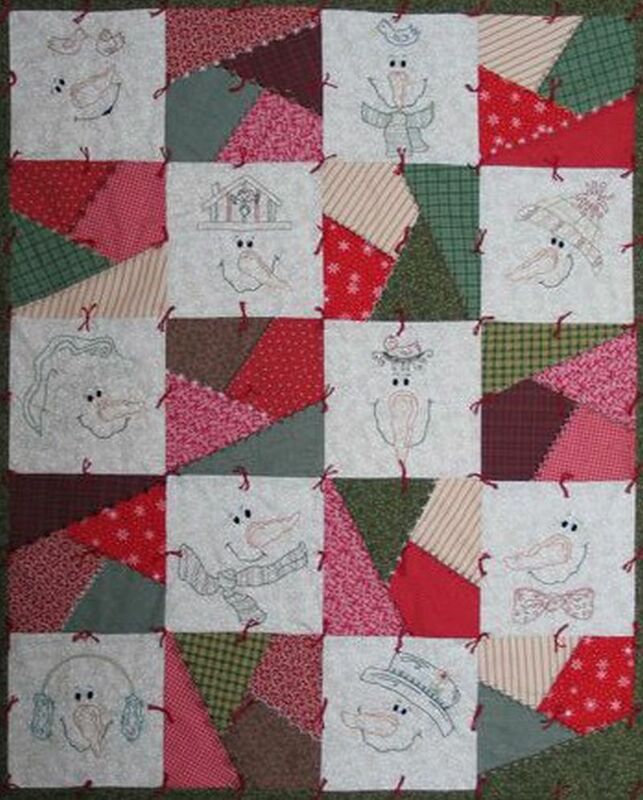 Oh, how I love snowmen! 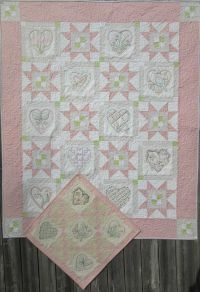 If you love them too, you will love stitching these cute little blocks. 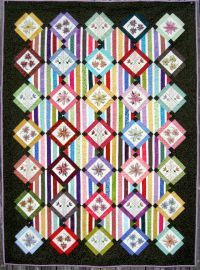 This is a great summer project when you long for winter. 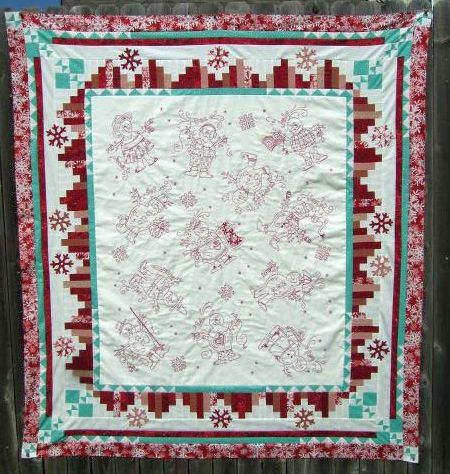 Or a fun winter project when snow is covering the ground. 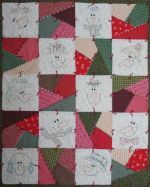 There are 37 snowmen, a snowflake and 3 crazy patch block patterns included! 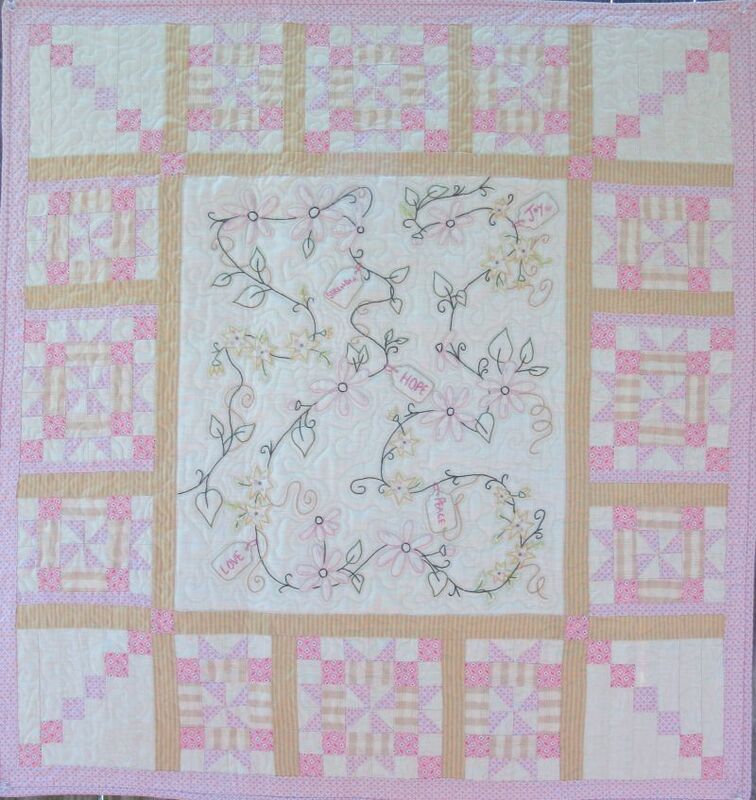 53 1/2" x 64 1/2"
This little lap quilt is in honor of cancer survivors and those still in the fight. 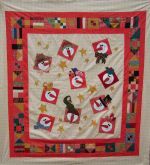 My wish is that this Quilt of Hope will help them feel loved through their battle. 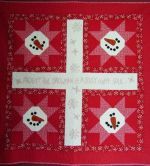 A mini size embroidery pattern is also included. 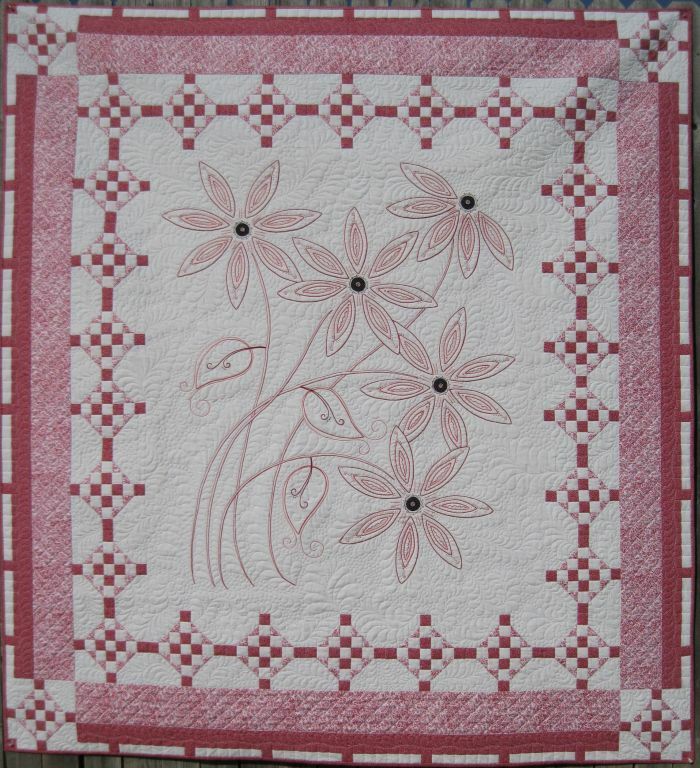 Welcome spring with this sweet embroidery quilt. 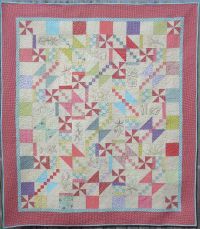 You can piece it using 1930's prints or go bright! 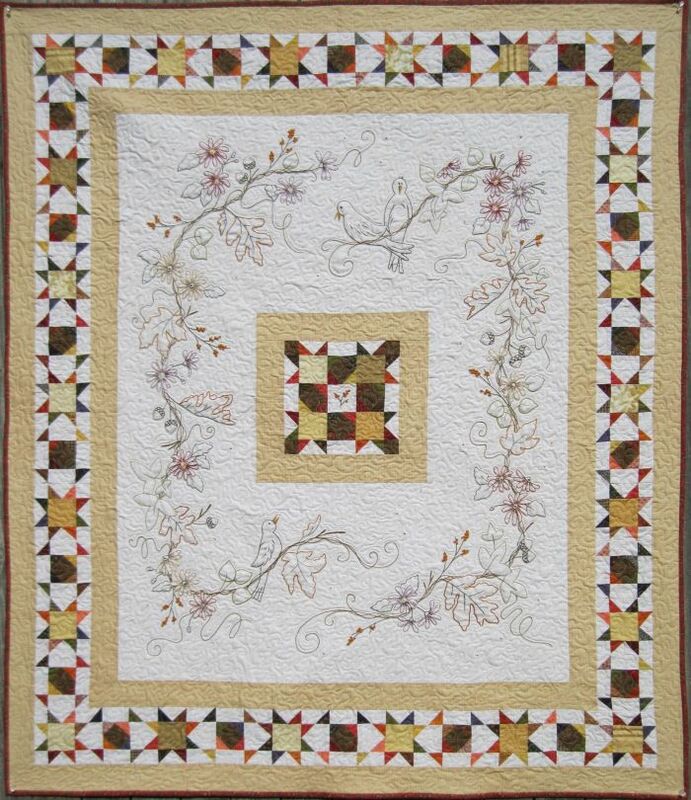 Either way, you will enjoy this spring beauty. Both the large and the mini quilt patterns are included. 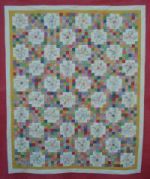 Need a little color in your life? 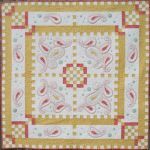 Do you have a collection of wonderful fat quarters? 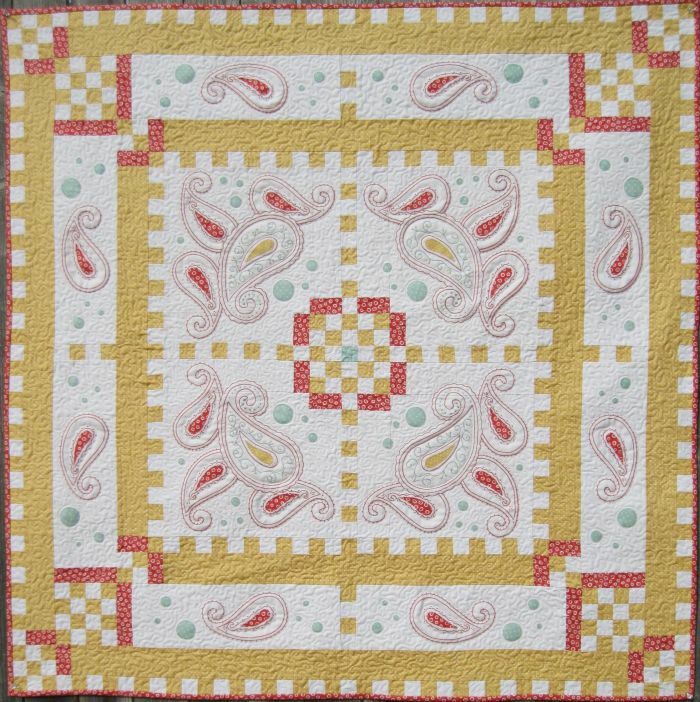 This colorful embroidery quilt is for you! 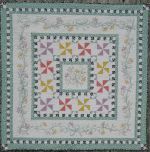 The designs are included in 2 sizes. Don't the birds seem a little more chatty in the fall when the air is finally cooler? I know they are saying "it feels like fall!". 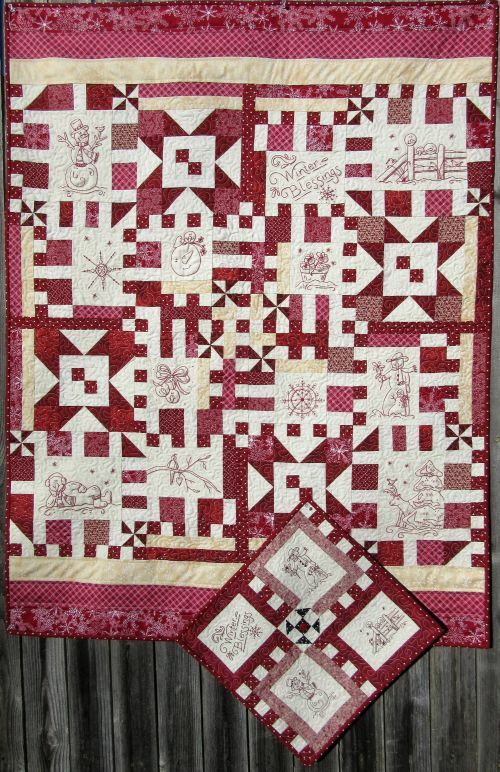 This is a fun little quilt to stitch and enjoy. 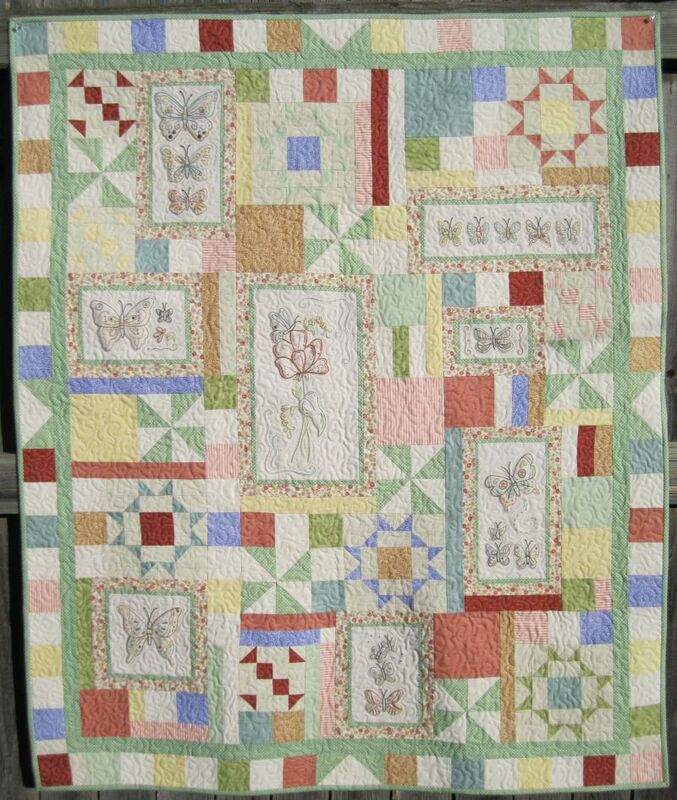 This quilt just says "spring is here!". 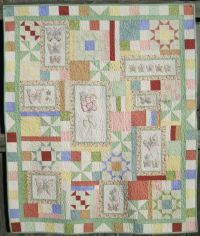 You can stitch and piece it using soft colors as I have or you can use all the bright fabrics from your stash. 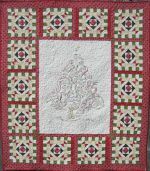 Embroidery these cute smiles and enjoy a new holiday tree! 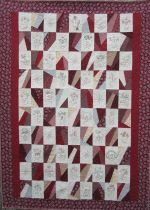 This would look great in redwork too! 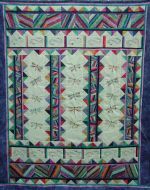 There is nothing as lovely as a continuous embroidery border. 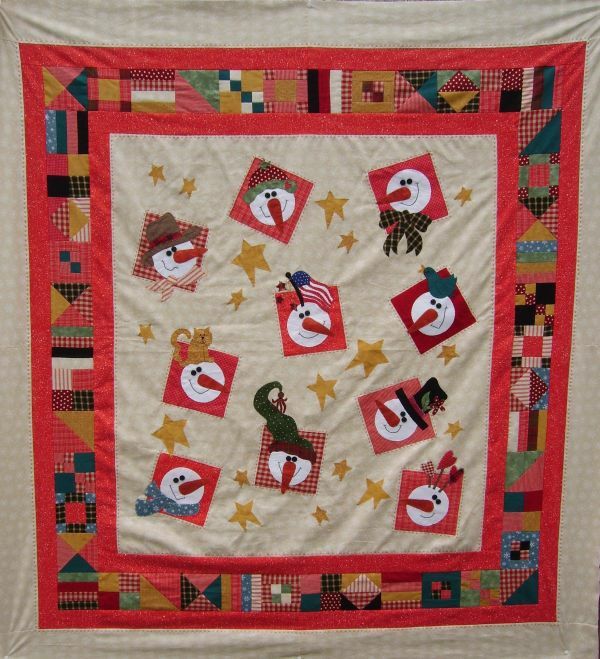 Combine your stitching with a little applique' to make the perfect baby gift! 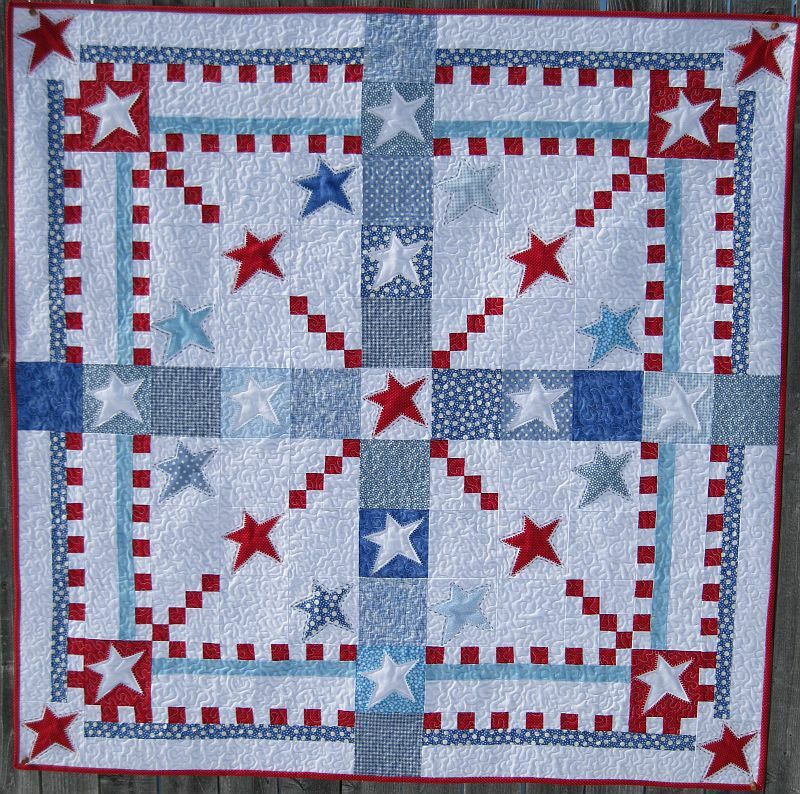 Do you have a new little star in your life? 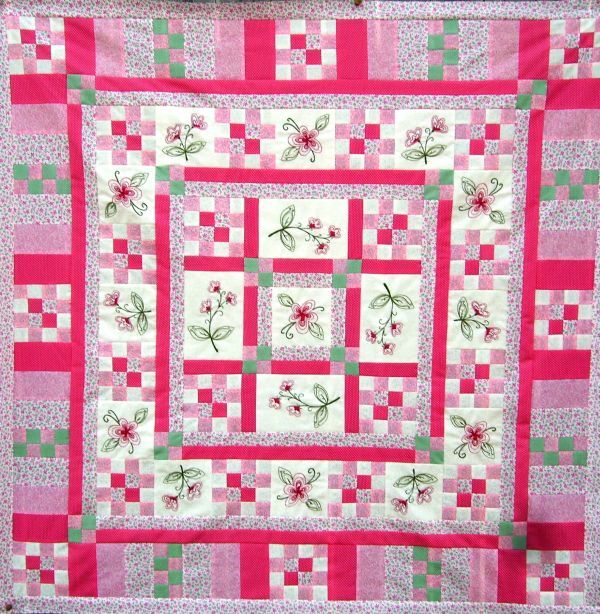 You can piece this sweet quilt in a jiffy in any colors you choose and celebrate the new arrival. 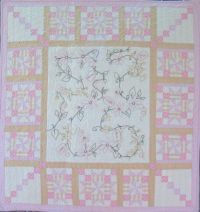 Have fun with embroidery and a little applique' to create this sweet petite! 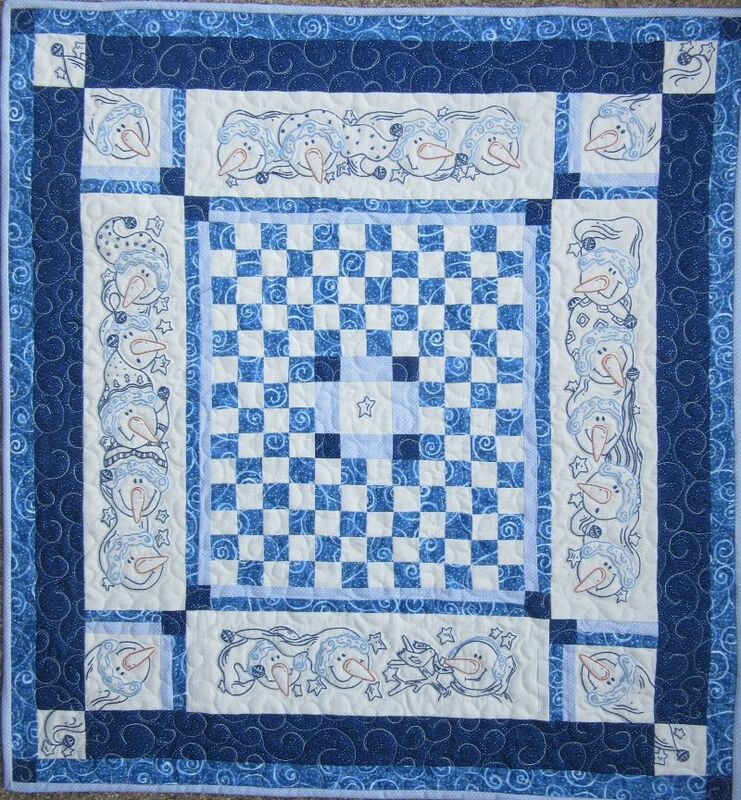 This quilt would look great in any colors you choose. 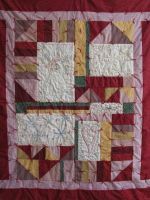 This pattern is easy to transfer after you piece the center fabric because it's on one large sheet of paper ready to trace. 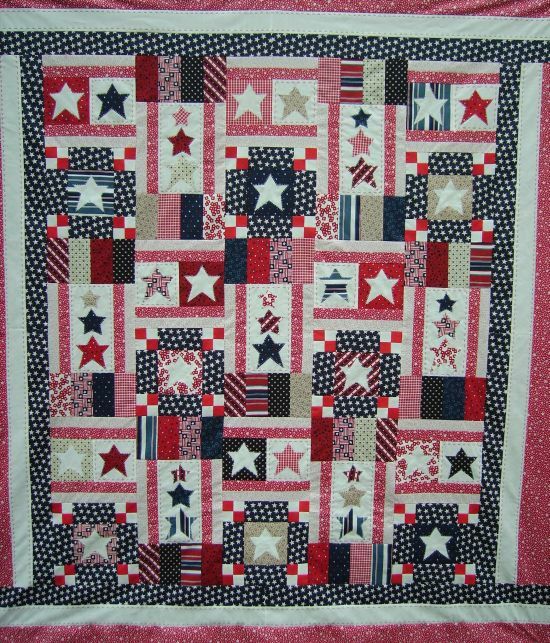 You can use classic civil war fabrics as shown or use bright fabrics to welcome the summer. 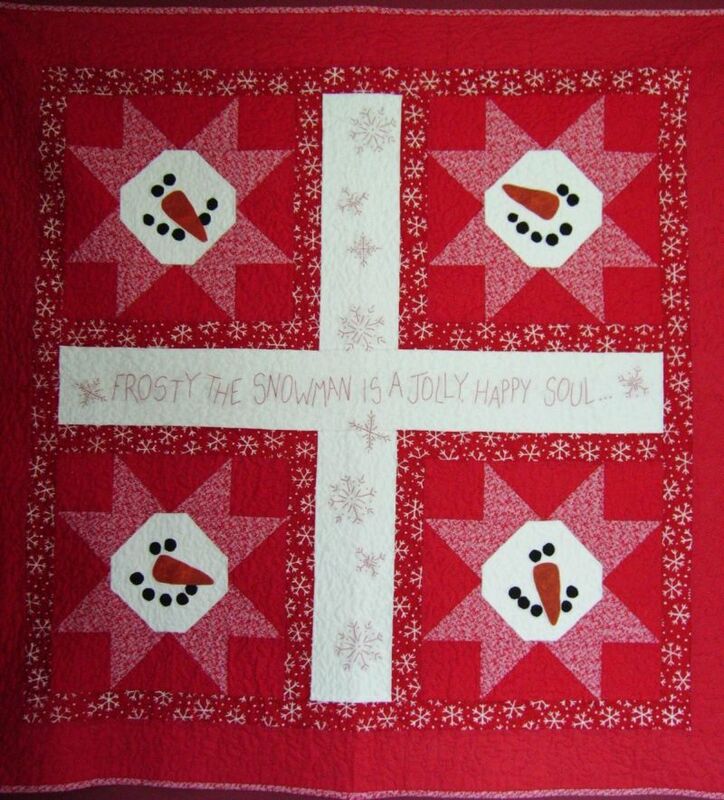 Embroidery these sweet snowmen in cool blue or vibrant red. Either way these cool guys will find a place in your heart. Embroidery these dragonflies and enjoy their summer dance. 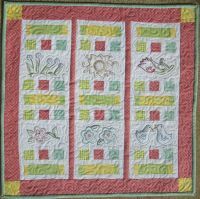 You can piece it using bright batiks or pastel prints. Either way, you will enjoy the dance! 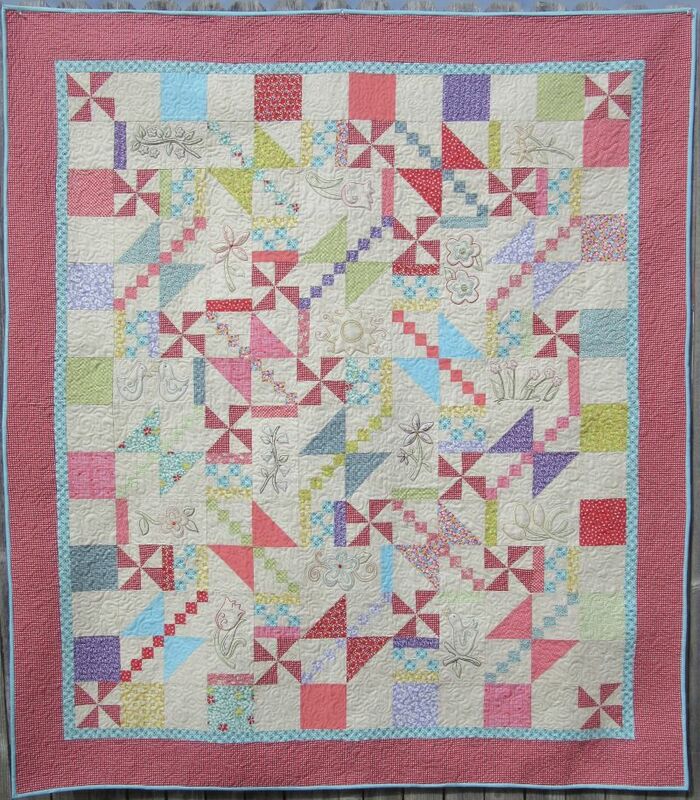 Do you need a baby gift? 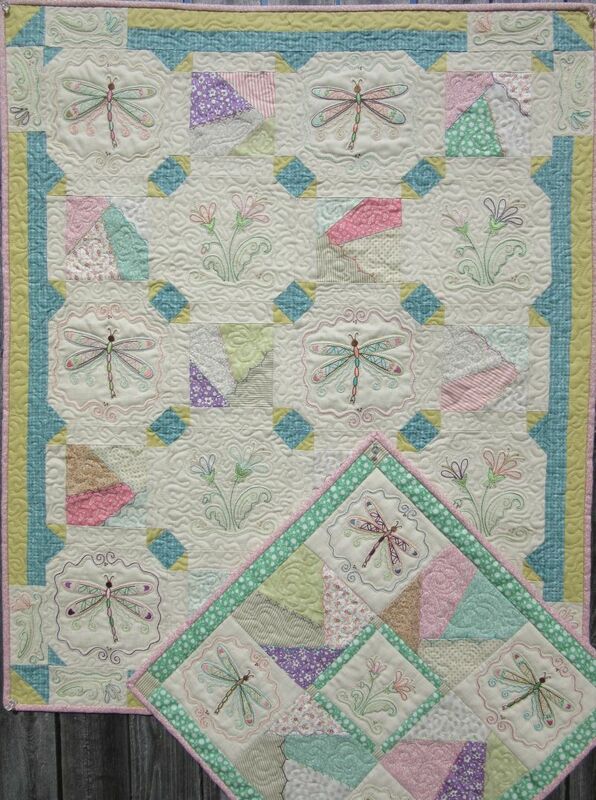 Use your embroidery skills and stitch these cute flower blocks and then piece them into this sweet baby quilt. 61 1/2" x 65 1/2"
Fall colors are nature's art! 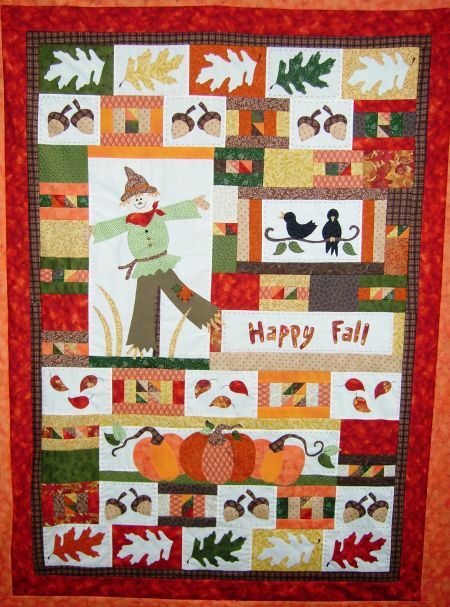 Enjoy all of fall's glory with this quick applique' throw or wall hanging. 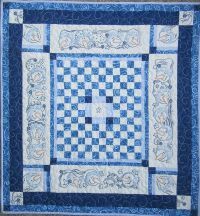 This is a fun little appliqué quilt with an easy pieced border. These snow cuties will warm your heart. 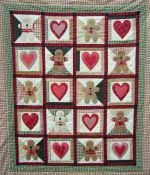 Gingerbread all around! 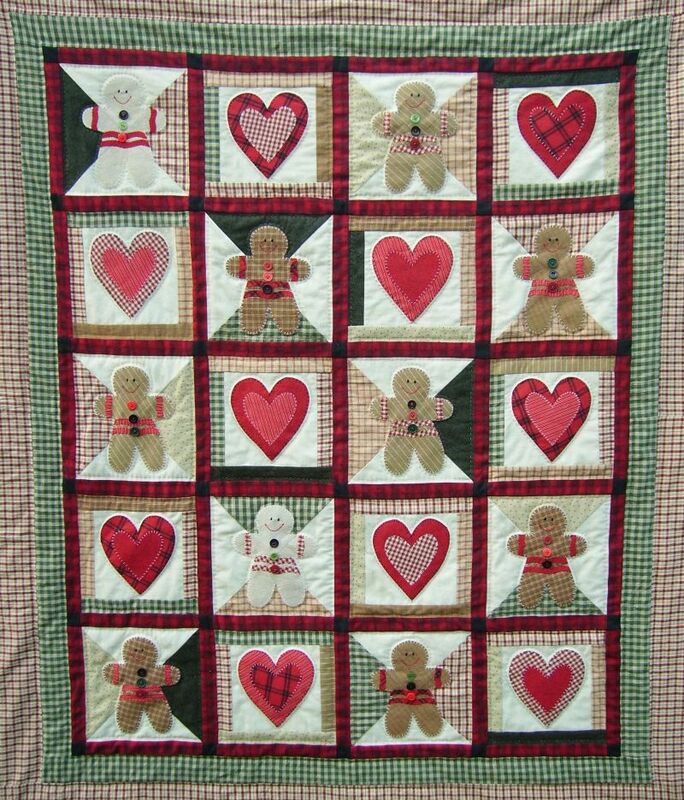 This is a sweet quilt for gingerbread lovers. 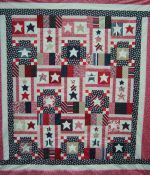 America, how we love her! Thank God for the brave to protect her. I love beautiful, fast melting Spring snows! Those snows always make the best snowmen! 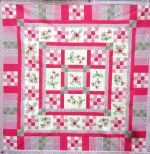 A mini quilt pattern is also included. 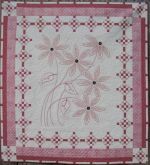 Embroidery is an art in itself. 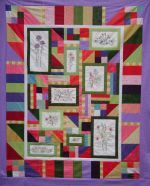 You will love stitching these colorful flowers and then piecing them into a bright, wild quilt. 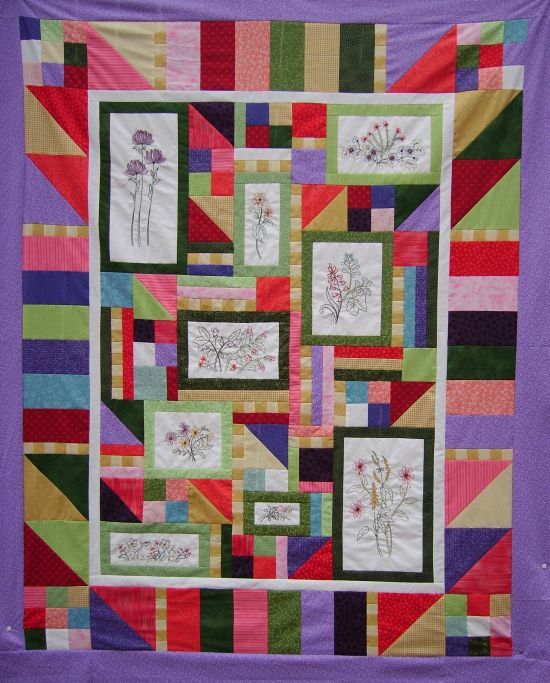 Welcome to my color garden! 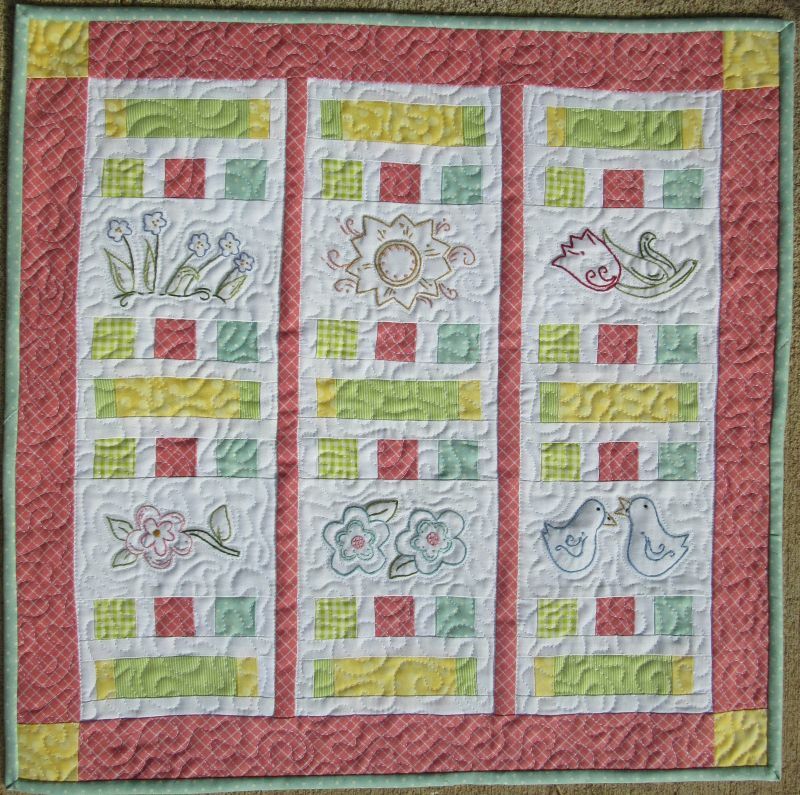 Enjoy the arrival of spring by stitching these fun spring flowers. 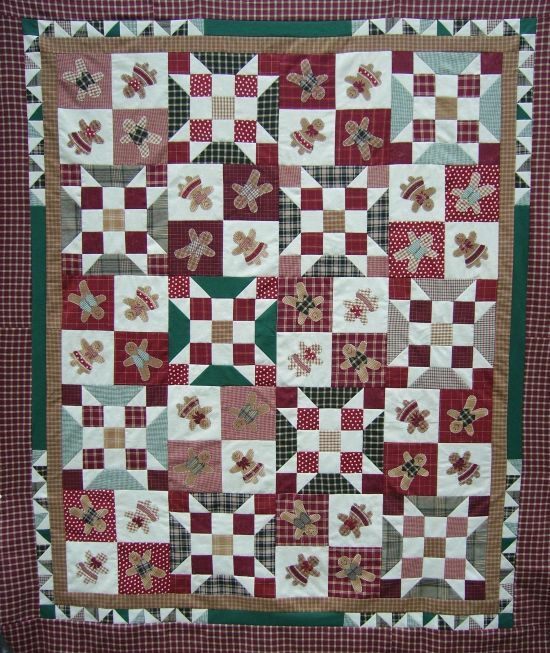 Sew them together with bright pieced blocks and cute buttons. This is a new twist on redwork. 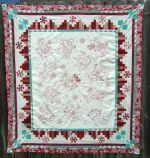 This pattern has added coral red and a darker red double line of embroidery to add sparkle to the embroidery. Oh, how we love Frosty! 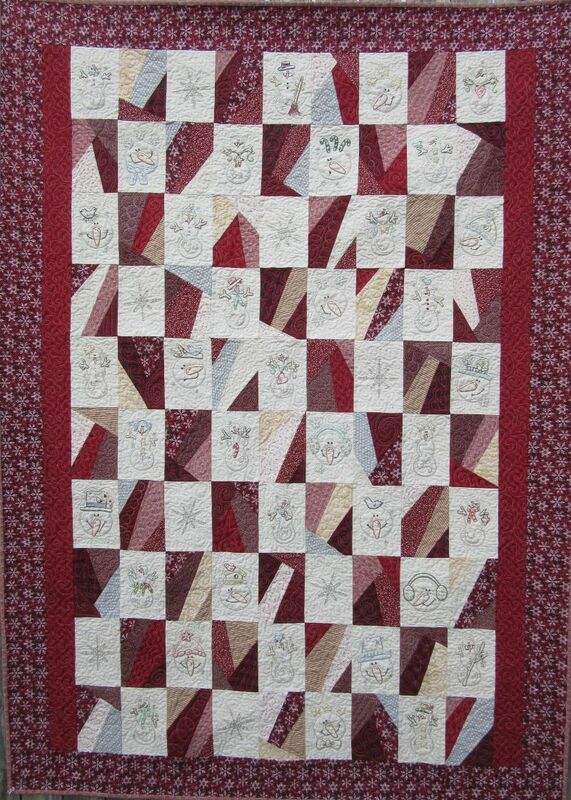 This is the perfect winter's day project. 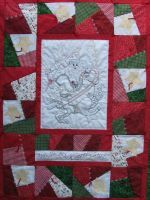 All you Santa collectors find your embroidery needle and get crazy! 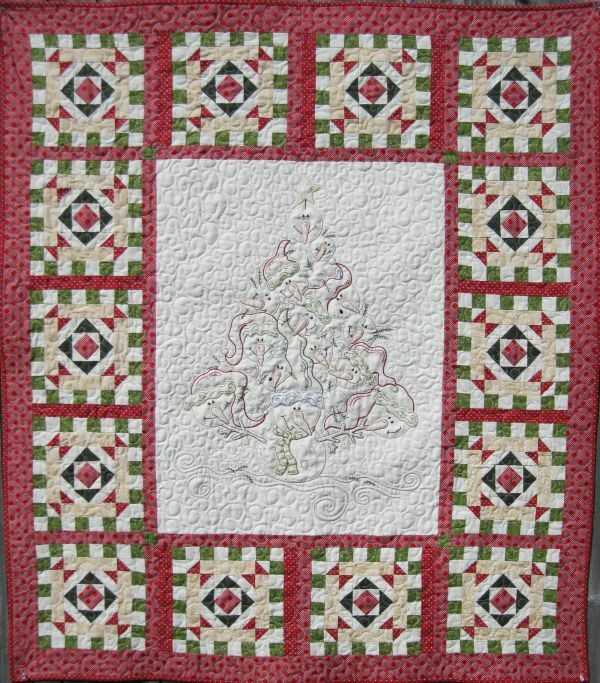 This Christmas quilt will get you in the holiday mood. Winter Blessings to you and yours! 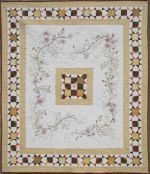 Pictured on 37" Square A mini quilt pattern is also included. 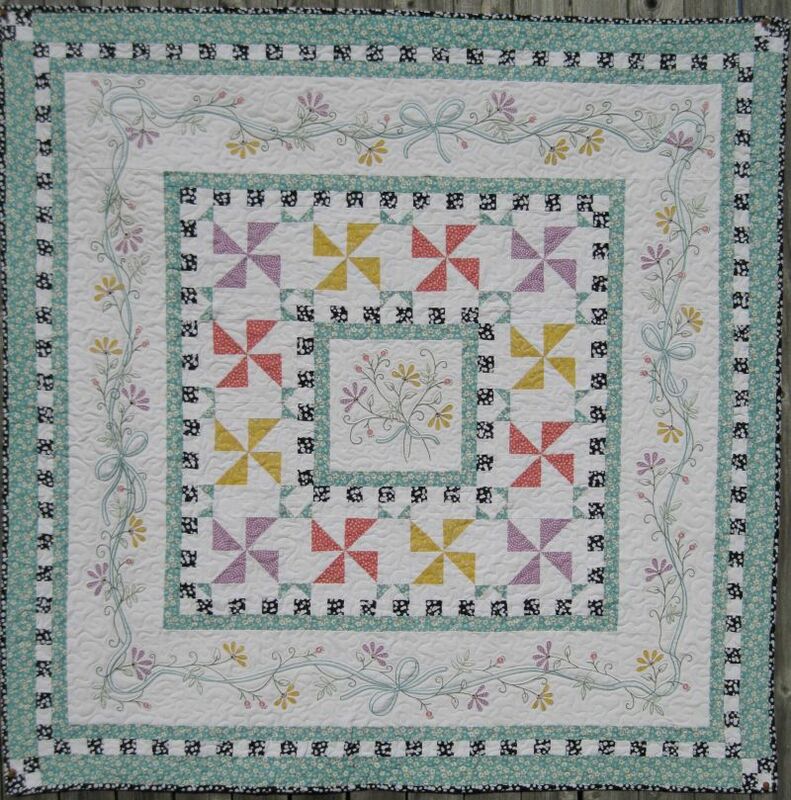 This is our most popular pattern. 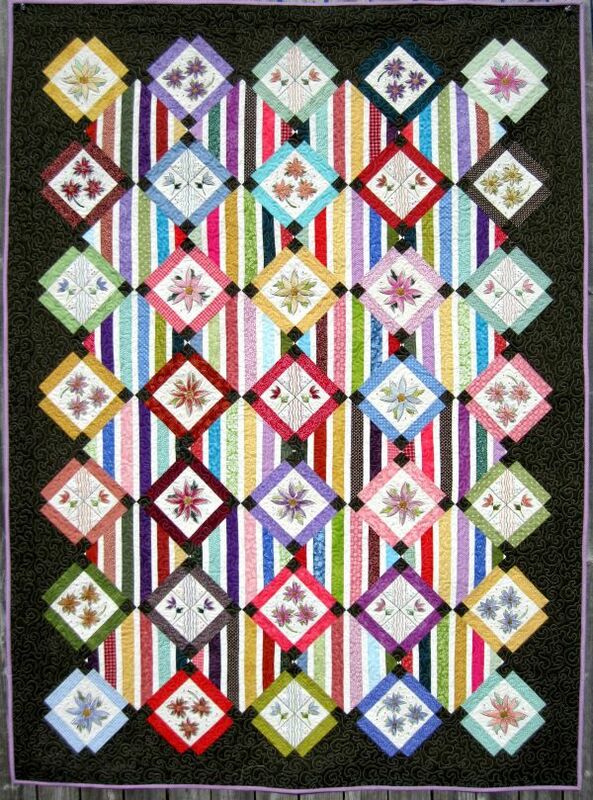 This is the perfect throw for a cold winter evening. 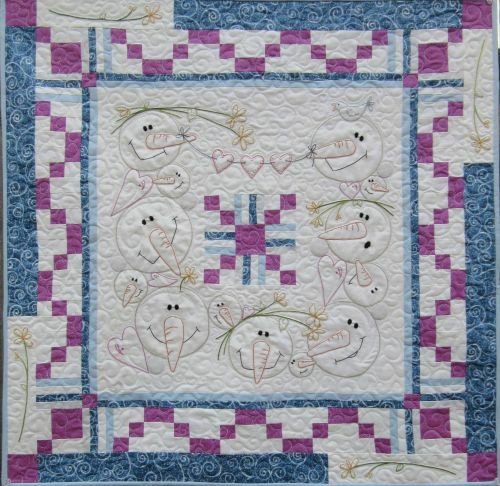 You will have fun embroidering these sweet faces and piecing easy crazy patch blocks. Snow friends wish that the snow would last one day longer. 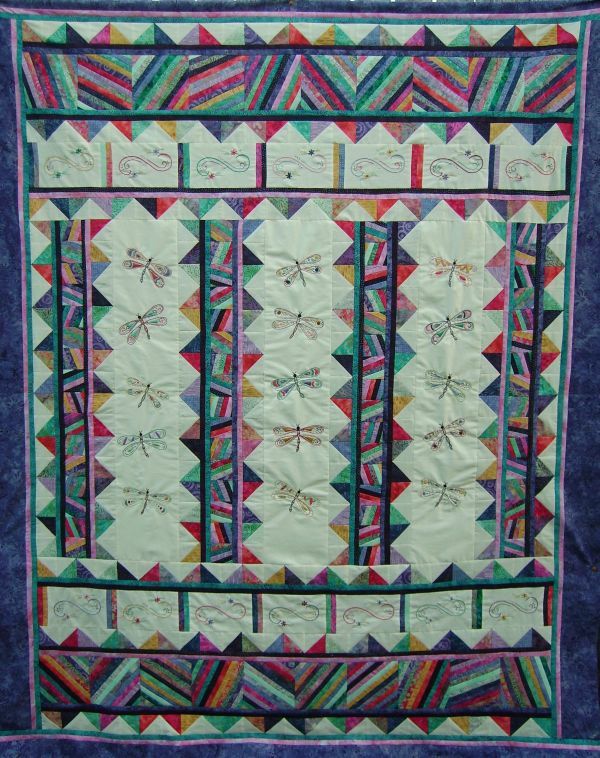 Let's all wish for more snow days. 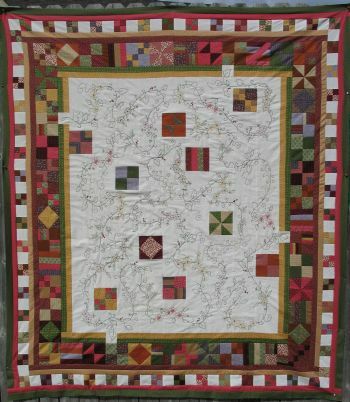 Snow days are quilt days!